Philippines Flag, facts and figures. The Philippines flag as we know it today, is revered by all Filipinos the world over. It is there national identity and like all nations the world over, conjures up pride, nationalism and can create heroes. The design of the Philippines flag, was concepted by General Emilio Aguinaldo, whilst in exile in Hong Kong. The year was 1897. The three golden stars in each corner of the white triangle represent the division of the Philippines into three island groups. The colours of the Philippines flag are also symbolic. The white of the triangle shows equality and fraternity. The blue is representative of peace, truth and justice. The red stands for patriotism and valor. - On all Philippine registered shipping over 1000 GT and naval vessels the Philippines flag shall be displayed at the stern whilst at anchor and from the gaff whist at sea. - The flag of the Philippines shall be flown with the blue at the top during peace times. 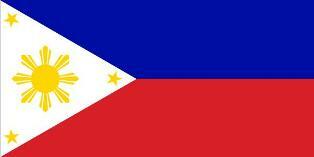 - During times of war the Philippines flag shall be flown upside down with the red at the top. - When the Philippines national flag is flown with other countries national flags, the Philippines flag must be flown on a separate pole at the same height and size. It shall be hoisted first and lowered last. - A Philippine flag that is showing signs of wear and tear, can only be destroyed by burning. This is to avoid any misuse. It must be immediately replaced. - If the weather is inclement, the Philippine flag may not be raised, if it is already raised, the flag must remain raised. - The flag of the Philippines may never touch anything below it, like the ground, water or any other objects. - President or former President for a period of ten days. - The Vice President, Chief Justice, President of the Senate and the Speaker of the House of Representatives, for a period of seven days. - Any other person to be determined by the institute, for a period less than seven days. - Casket covering shall only be used to honour the dead of military, veterans of previous wars, national artists and of civilians who have rendered distinguished service to the nation. - The casket flag shall be placed so that the white triangle shall be at the head and the blue portion shall cover the right side f the casket. - At no stage shall the Philippines flag covering the casket ever touch the round, it shall be folded and handed over to the deceased heirs.